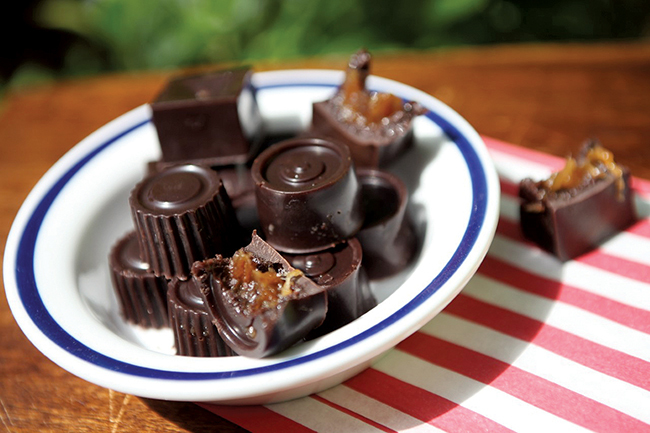 Sweet date caramel enrobed with rich raw dark chocolate makes for a delicious sweet treat. They’d make fantastic handmade Christmas gifts too! For the your date caramel, add your dates, coconut oil, almond butter and water to a food processor and blend under smooth. Scrape the caramel into a dish and set aside. Add the cacao butter to a saucepan and melt gently over a low heat. If it gets too hot, remove from the heat occasionally. Once melted, add the cacao powder, agave syrup and vanilla extract, whisking until smooth. Use a teaspoon to evenly pour a little chocolate into moulds and place the moulds in the fridge for a couple of minutes to firm up. While they are chilling, keep your chocolate warm. Once firmed up a little, spoon the caramel mixture into the moulds, trying not to make it touch the sides but rather centred in the middle. Use a teaspoon to spoon the rest of the chocolate evenly on top of each mould, then refrigerate for a few hours until firm.